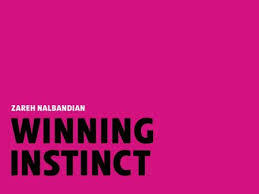 The Winning Instinct is better known as the ‘killer instinct’. Whatever you call it, this instinct is a mind-set that you can either be born with or cultivate and refine over time. It has to do with confidence in yourself and your capabilities. A person with this winning instinct is almost impervious to outside force and pressures as he or she is encased in what seems like indestructible armour. As this instinct becomes stronger there is enhanced acceptance of things that are human and therefore bound to happen. There is no shying away from fear or rejection and one admits to feeling low and ashamed at times. The winning instinct allows a person to forge ahead without hesitation despite some negative and maybe even painful emotions. Soon this instinct becomes natural and effortless – an expression of your most innate being. How amazing is that! I am not implying that you would always win or that you need to win at ‘any cost’ – having a winning instinct gets you past obstacles and problems faster and with renewed confidence. How do you know whether you possess the winning instinct – the killer drive that you so envy in others? Given below are a few points, which in my opinion a person with this winning desire would have. – Each person has some objectives and goals in life. A person with the killer instinct has a keen sense of what his or her ambitions are and would be willing to stretch their physical and mental limits to achieve success. Such a person not only accepts that situations would be incompatible with their goals but would also know what to do in order to survive the onslaughts of nature and fellow humans. – A person with a winning instinct displays amply the courage, steadfastness and obstinate resolve to succeed. They have the ability to accomplish tasks well and in the shortest possible time. Killer drive enables the person to conquer one’s own limitations and bad habits and by removing them, make place for positivity and winning in their lives. Those who wish to cultivate the winning instinct must consciously work towards ridding themselves of their own personal stumbling blocks. – It is a misconception that a person who is shy or timid cannot possess the winning instinct. Such people can be inherently strong through facing a number of instances of rejection, ridicule and even lost opportunities. They can over time develop a state of mind that not only ignores these adversities but also overcome them time and again. You don’t need to be ‘vicious’ to possess the killer instinct. – In a structured and modern world, the killer instinct does not mean actually killing to secure one’s needs and interests. Successful and wealthy people are held in high esteem and it is assumed that would have used this instinct to move ahead and would have refused to fall prey to the scheming designs of their adversaries. The winning instinct is about being in touch with your innate courage and strength and the ability to gain complete control for the fulfilment of one’s goals. It is the power to take action and make things right, despite stumbling blocks and situations and people who tell us that we cannot.